When i first moved to new york city to attend college, I had never heard of a bagel or deli. Hard to believe? Not at all. Before the internet or cable television, life was much more insular and information much more local. Growing up in a small bluecollar town in New England I was exposed to very little. Cappucino was unheard of. But it was only minutes after arriving in the Big Apple, however, that I sampled my first New York style cheesecake. And bagels and heros ("grinders" where I came from) were soon to follow, in my full immersion in NYC culture. Along with the Sabrett hot dog, NY Pretzel and egg cream, I can't think of many food items that better epitomize New York City than the bagel. My best friends in college were Jewish and I quickly learned the ways and means of New York from them, with yiddish expressions - schlamiel, schlamazel, oy vey. The bagel became a staple in my life. Satisfying, substantial. The quintessential NYC breakfast for a New Yorker on the run. H&H Bagels is the city's largest manufacturer of bagels, producing millions per year from their factory on 12 avenue and 46 street. 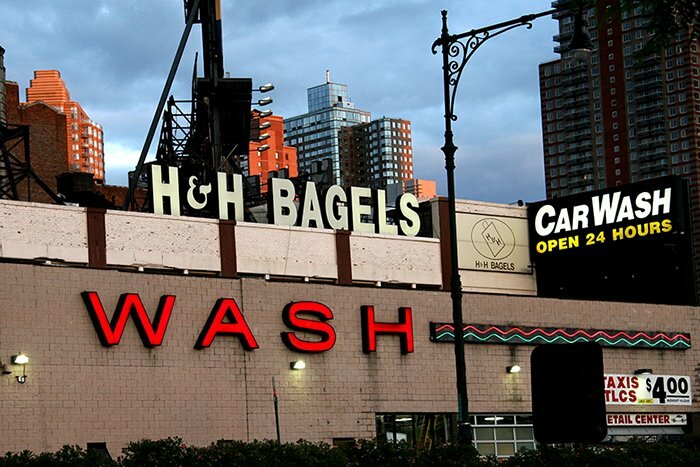 The sign, along with the Car Wash, is a familiar site to those who have traveled along the West Side Highway. H&H was founded in 1972 by Helmer Toro. You can find them at many locations including their flagship shop at 2239 Broadway.